Choosing a new mattress for your home is an exciting time. If you’ve been sleeping on the same mattress or the past few years, it might be time for an upgrade. Traditional coil mattresses are cheap, but they’re nowhere near as nice as foam or memory foam mattresses. In the past, foam mattresses have been too expensive for many consumers to afford. 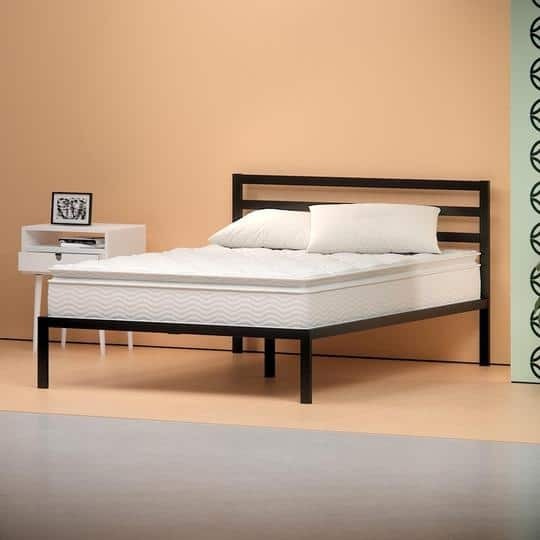 E-commerce is changing the game – you can now find a range of cheap foam mattress options online without having to worry about breaking the bank. One of the newcomers to this industry is Zinus Mattress. This company knows what it takes to bring affordable foam mattresses to the public. They have a variety of different models that help people at almost any price point. For the sake of this article, we’ll be taking a look at one of their most prominent mattresses. The most popular mattress that Zinus Mattress produces is the Green Tea Memory Foam Mattress. This mattress is simple but effective – it provides you the basics that you’re looking for in a foam mattress. It also happens to be the most affordable mattress on the market. 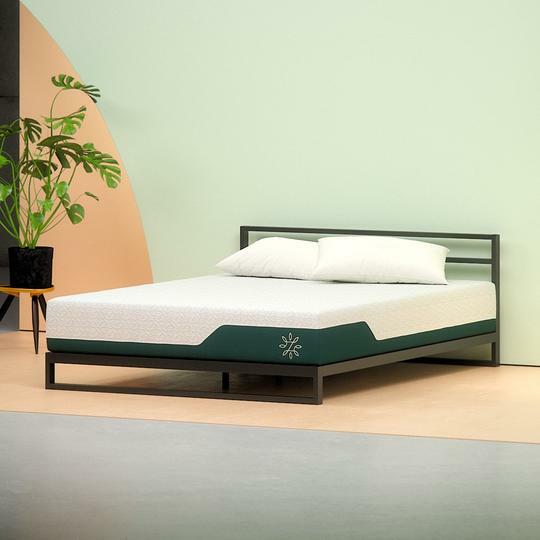 In this review, we’ll be taking a look at the Zinus Mattress Green Tea Memory Foam Mattress to provide you with all the information you need to decide if you want to buy it. We understand how hard it can be to choose a mattress – that’s why we have put serious effort into compiling all the information you need. If you’re in the market for a new mattress, make sure to check out all the information below! Should I Buy the Zinus Mattress? The way a mattress is constructed can tell you a lot about how it will feel. With the Green Tea Memory Foam Mattress, Zinus Mattress provides their customers with four different options. They have four different thickness levels – this helps customers better estimate the exact type of mattress they’re looking for. This is a great benefit that you might not find with many other mattress producers – many modern mattress companies have a one-size-fits-all approach to their mattress designs. In this section, we’re going to take a look at the exact way the mattress is constructed. This Green Tea Memory Foam mattress boasts a pretty simple design, but it changes depending on the size you order. The Green Tea Memory Foam Mattress from Zinus Mattress uses a few different foams in its construction. There are no coils or hybrid options in this mattress design. Memory foam and support foam make up the entire mattress. Memory foam provides the comfort, while the support foam provides the base you need to keep the mattress firm. Below we’ll take a look at the exact layer design of each size of mattress. As you can see, there is quite a bit of variation in each mattress depending on the thickness level that you choose. Regardless, all of the option are a relatively basic design. Because of the price point, you won’t find as much complexity in these designs as you would with more high-end mattress products. The outside cover of a mattress has the potential to compliment a mattress, or destroy it. If a mattress cover is too thick, it will ruin the top layer texture of the mattress and retain too much heat. On the other hand, it it’s too thin, it will end up not providing enough protection or support for the mattress. The Green Tea Memory Foam Mattress from Zinus Mattress is made from a thin Kitted Jacquard. It does a great job of adding support without adding to much additional heat retention issues. If you’re trying to buy a memory foam mattress, you’re probably very concerned with the way that the mattress feels. It can be hard to find a mattress that suits you perfectly, but a comfortable mattress isn’t too hard to attain if you know what you’re looking for. The memory foam on the Zinus Mattress provides the sensation that you’re sleeping on a cloud. You’ll feel contour and hug around your body as you lay down on the mattress. The exact support and comfort that you’ll experience will depend on the mattress that you purchase. The thinnest mattress variation provides the least amount of comfort – there is only 1” of memory foam between you and the support layer. While the thicker mattresses have a lot of added foam for additional comfort. This is by no means as good of a mattress as Tempurpedic or another high-end brand. In terms of support, it will depend on the mattress you purchase. The thicker the mattress, the more support you will feel. None achieve a level of above 7.5/10, so this isn’t a great mattress for those who weigh over 230 lbs. The primary downside to the Green Team Memory Foam Mattress from Zinus Mattress is heat retention. Foam mattresses can often retain a lot of heat, which is bad for people who need a mattress with breathability. Because there are no coils or gaps, the foam in the mattress does not breathe as well as other options. It’s important to keep this in mind if heat retention is an issue for you as a sleeper. By all accounts, Zinus is a relatively new entrant to the mattress game – they haven’t had much time to develop on their current models. The mattress we are reviewing has not undergone any massive changes over the past few months, but Zinus Mattress does have other mattress models with improvements and alterations – though these tend to cost more. If you’re looking for something a bit different, or you want to see the way they have evolved via other mattress models, make sure to check out some of the other mattress options on their site. For the sake of sinkage tests, we’ll take a look at the 10” model of the mattress. The amount of sinkage a mattress has determines how far you will fall into the mattress when you lie on it. If you’re lying on your back, you will find around 2.5” of sinkage. If you’re lying on your side, you will find about 3.5” of sinkage. This is assuming you weigh around 150 lbs. This level of sinkage is quite high, especially if you’re someone who is overweight. One of the best parts about the Zinus Mattress is how cheap it is. You won’t have to worry about breaking the bank if you want to purchase their luxury mattresses. The price of the mattress will depend on the thickness that your purchase. The thinner the mattress is, the cheaper it will be. It’s easy to overlook the additional benefits or features included with a mattress that you purchase. If you’re someone who is only concerned with the look and feel of a mattress, you might find that you run into problems long after your purchase. For example, you never want to purchase a mattress that doesn’t come with a warranty. A mattress is a long-term investment and should be treated as such – you need to put yourself in a position where you’re exposed to little risk. Many modern mattress companies have to differentiate themselves from competitors by offering added benefits. In this section of our review, we’re going to take a look at all the additional benefits you’ll receive alongside your Zinus Mattress. It’s important to take these into consideration if you’re thinking of purchasing one of their mattresses – without understanding these features and benefits, you won’t be able to get the most out of your mattress. Shipping a mattress can be extremely expensive, so you want to make sure you can reduce this cost as much as possible if you’re going to order a mattress online. Finding a cheap and comfortable mattress can be great, but if you have to pay hundreds of dollars to ship it you might find other mattresses are cheaper. But you don’t have to worry about this if you purchase a mattress from Zinus Mattress. They provide completely free shipping with the purchase of any mattress. They use FedEx to deliver all of their packages – you can be certain your shipment will be handled with the professionalism of a large, multi-national shipping company. This is the most crucial component of any mattress purchase – you need to be certain that the company you’re working with understands how significant your investment is. You don’t want to run into any problems that can’t be fixed. With Zinus Mattress, you’ll be entitled to a full, 10-year warranty that ensures you can receive a replacement mattress should you run into any problems. This is a huge benefit if you’re looking to make sure you don’t need to pay for a mattress any time in the next decade. This warranty length is around the industry standard, though some do offer longer warranties to their customers. Ordering a mattress online can seem counter-intuitive – how can you know you want a mattress until you sleep on it? Fortunately, with Zinus Mattress you receive a 100-night trial to help you fully experience the mattress. You have to pay for the mattress upfront, but you don’t like it you can return it for full refund within this timeframe. 100 nights is a fairly decent trial period when compared to the industry standard. Many top mattress producers only offer a 30-day trial period. With Zinus, you have over three months to decide if you want the mattress or not. One unique feature that Zinus offers its customers is a fully functioning support site. If you head to their website, you can find their support site and use it to view your orders, register your product, and more. They even have an FAQ section that you can use to fix small problems or find common solutions. This is a great feature that you don’t see with a lot of other mattress producers. If you’re wondering whether or not you should purchase the new Zinus Mattress, it’s important to weigh the pros and cons. If you’re looking for something cheap, this is truly one of the most affordable mattresses on the market. The fact that it comes with a variety of different thickness levels is also an added benefit. The major downside with this mattress is the heat retention caused by the lack of coils or hybrid material. This being said, for the price point, it’s hard to find much better. 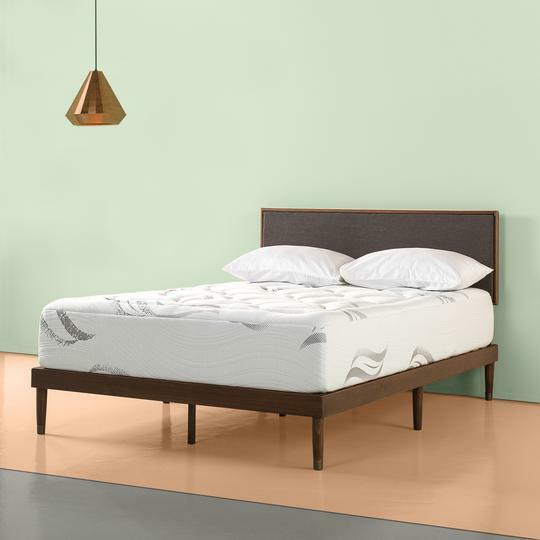 With a long warranty and trial period, as well as free shipping, the Green Tea Memory Foam Mattress from Zinus Mattress is an overall good deal. If you’re in the market for a new mattress, but you don’t think the Zinus Mattress is right for you, we have plenty of other reviews listed on our site. Make sure to check out all the information provided on our webpage – we’re a great resource if you’re in the final stages of choosing a new mattress.